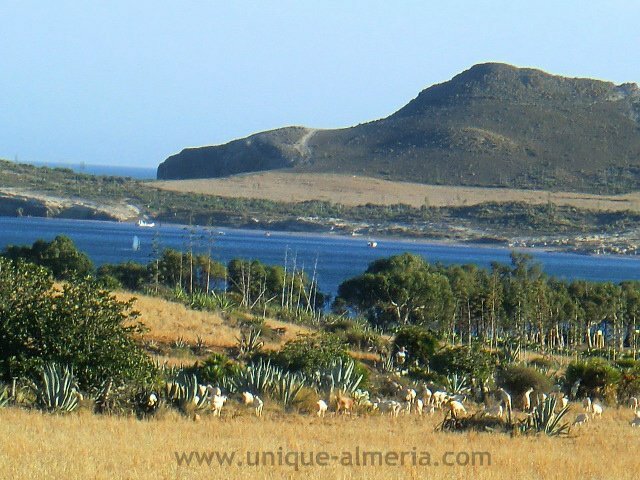 This is one of the most famous and emblematic beaches of the Natural Park Cabo de Gata and the longest in this area (1200 m). 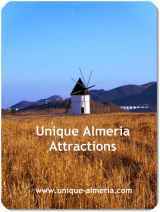 Its got its name from the landing of the Genevan fleet in 1147 that came to support the Spanish troops in order to conquer Almeria, which by then belonged to the Muslim kingdom of Granada. Los Genoveses is a pristine beach, no buildings, no power lines, no bars, no roads, thus it has maintained its natural wealth. We love this beach, because it is suitable for all family members. The little ones of the family have fun, running into the shallow water, being this a very flat beach. If you want to swim, you must walk and walk and water does not reach beyond your waist during a long time. Our teenagers enjoy the waves. Yes, in the middle of the bay there are always waves on which they love to ride, so do not forget to bring a surfboard! 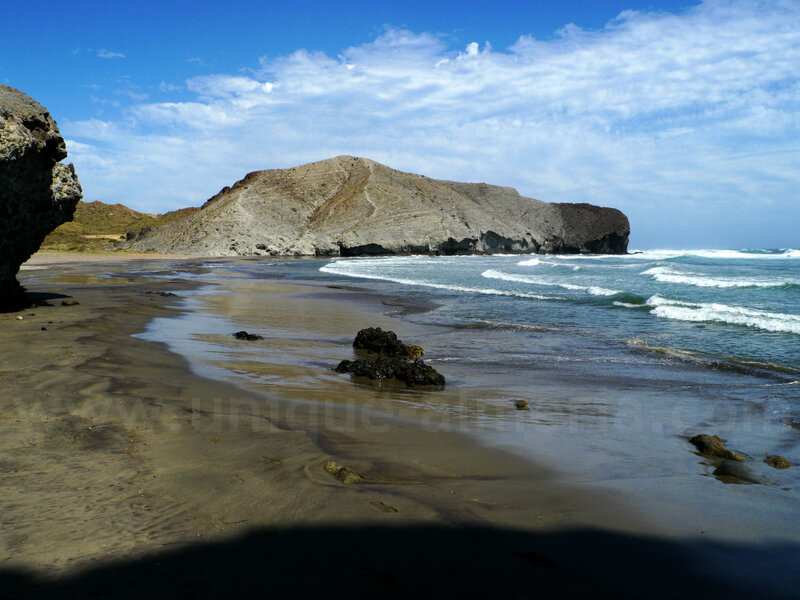 The surrounding is wonderful too: sand dunes, where you can collect seashells, a small eucalyptus forest and the "Morron de Genoveses", a 85 meter high volcanic ridge The Morron environment is one of the six areas of the Natural Park's Marine Reserve, which have a higher level of protection. Choose a perfect beach day to come here, because on a windy day, the fine sand might become very uncomfortable, but on the other hand you might find the big waves enjoyable. 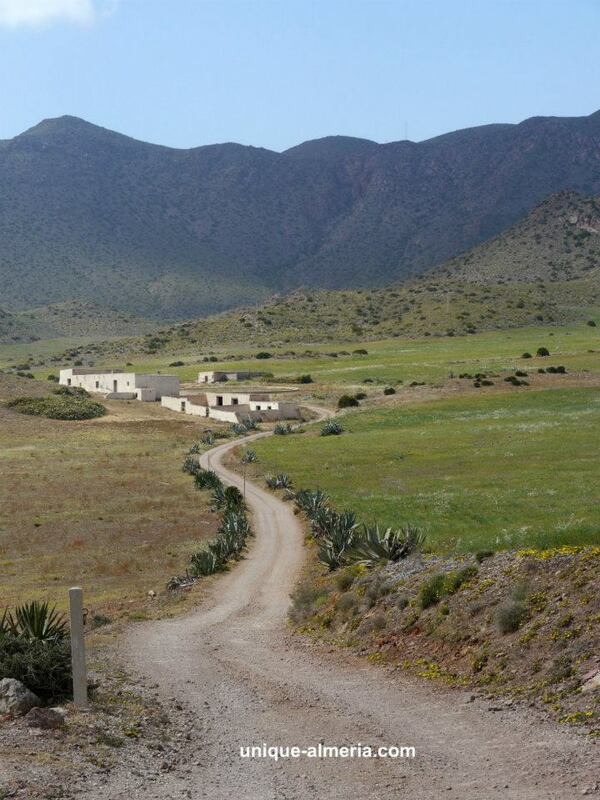 It is a natural area that is accessed by an unpaved lane past the town of San José. 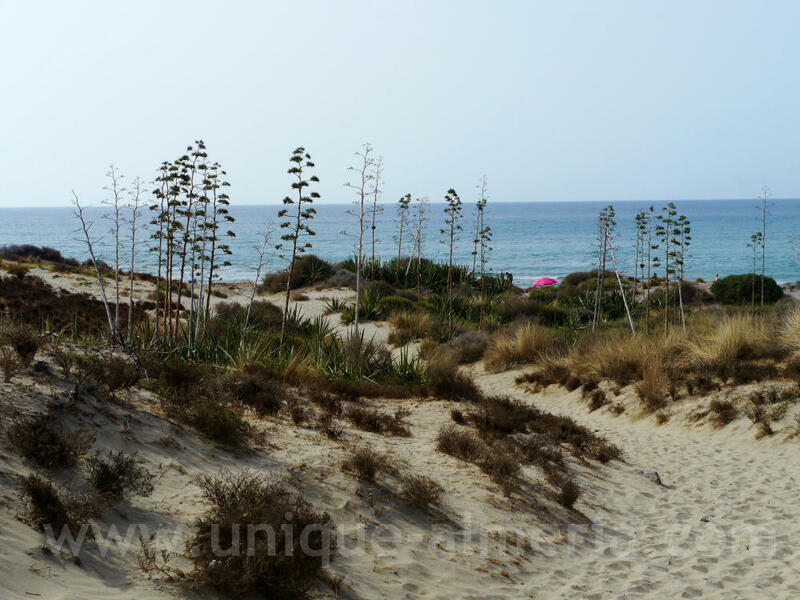 Look for the sign post on at the entrance of that village on your right, pointing you to this and other nearby beaches, like Cala Borronal, Monsul Beach and Cala Media Luna. 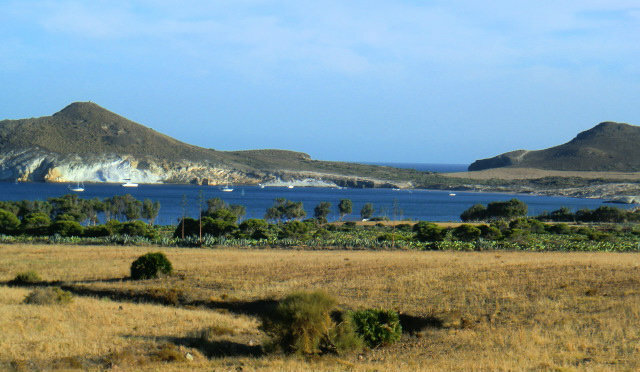 Before you spot the white cliff of Genoveses beach, you will see on your right hand side, is a typical farmhouse, which of course is privately owned. In order to get to the beach, there are two trails starting at the road where you leave your car. 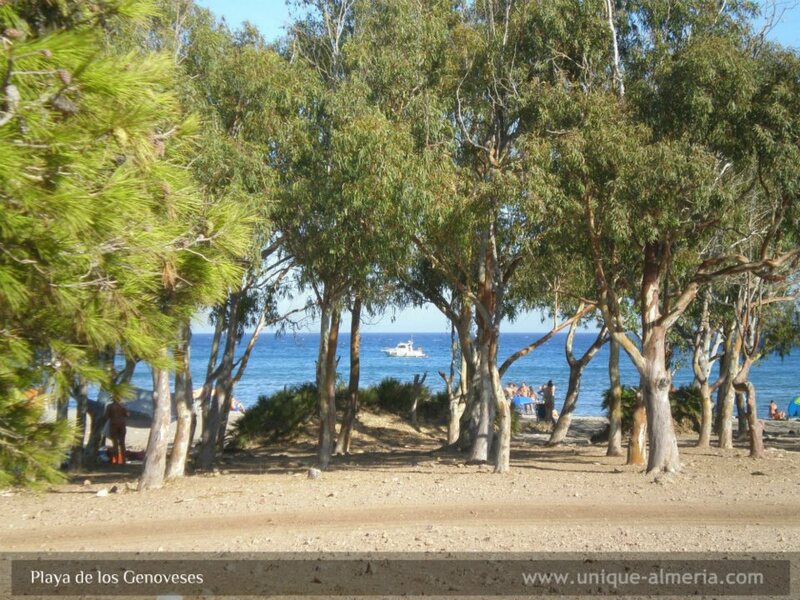 If you choose the first one, you will walk through a beautiful set of "chumbos" (cactus fruit plantation) until you arrive to a small eucalyptus forest right at the beach. The trees provide wonderful shadow and shelter. 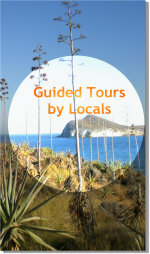 The second trail leads through some sand dunes until you arrive in the middle of the open bay. 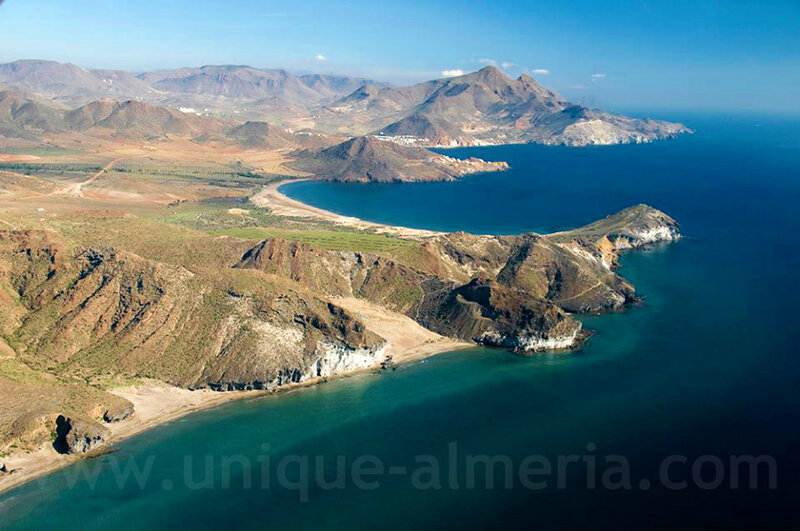 This bird's eye view shows the beautiful bay of Los Genoveses beach in the middle of the photograph as well as the nearby Monsul beach in the front and in the distance the village of San Jose.